Greens with separate tiers or levels are the bane of many amateur golfers. That goes double when a chip shot must traverse one tier to reach a pin on the other, requiring a deft combination of judgment and touch. Play a chip-and-run that flies low, lands on the bottom section and rolls up to the top. Hit a high-lofted shot that carries onto the top shelf and stops quickly. The first option is generally much easier to execute since it doesn't require you to carry the ball a precise distance with the height and spin to make it stop. When playing the chip-and-run, always remember your primary goal: to get the ball onto the same level as the flag. The last thing you want is to leave the ball short, on the bottom tier, leaving a long putt of the same difficulty. A less-lofted club, such as a mid-iron or hybrid, will produce a low chip with little spin and maximum roll. When chipping from a higher level to a lower one, carrying the ball to the bottom tier isn't usually an option as you may be unable to keep it on the green. Therefore, you'll need to chip onto the top tier and let the ball trickle down the slope to the hole. The primary objective is the same as when chipping uphill – to get the ball onto the same section as the hole for a makeable putt – so be sure the ball reaches the edge of the top tier with enough speed to send it down the slope. Playing a hole with a two-tiered green can present a challenge for a number of reasons. Obviously, if you find yourself on one tier and the hole is located on the other, you are going to have quite a difficult putt in front of you. Just managing to two-putt in such a situation is no easy feat. However, it is not only putting that is made more difficult by the presence of a tier in the middle of the green. Your chip shots are likely to be harder as well, and that is going to be the subject of the article to follow. When chipping to a two-tiered green, you could face a variety of potential challenges. For instance, you could be on the high side of the tier, chipping down the slope toward the cup. This would make for a shot which is very difficult to control, and you might have trouble even keeping the ball on the green at all. Or, on the other hand, you could be chipping up the slope to a hole which is cut just on top of the tier. In this case, you will need to make sure that you hit the ball hard enough to reach the top – but not so hard that the ball goes racing past the hole. As a third option, you might find yourself needing to chip across the side of the tier. This may be the most difficult position of all, as it can be extremely difficult to identify the proper landing spot to wind up with a good result. To successfully navigate golf holes which feature two-tiered greens, there are a couple of things you'll need to consider. First, you will need to have a plan to keep your ball in the right position whenever possible. By avoiding tough spots around the green, you can make your life much easier when it comes to the short game. Also, when you do wind up in a bad spot, you need to have a plan for how you are going to play these tricky chips. Even the best planning in the world can't keep your golf ball out of bad positions all the time, so a good player will know how to approach a difficult short game shot with confidence. Only when you have a smart game plan and the ability to get yourself out of trouble will you be able to reach your scoring potential. The first situation we are going to address is probably the easiest that we will cover, but it still has its challenges. In this case, you are going to be chipping up the slope, playing your chip from the low side of the green up to a hole located on the top of a tier. Right away, we can see that you have an advantage being in this position, in that you aren't going to have to worry too much about the shot getting away from you. With the tier available to help slow down the shot, it will be relatively easy to control your distance – especially when compared with the opposite situation of chipping down the hill. With that said, you still need to pay attention first and foremost to the speed of the shot. Specifically, you want to make sure that the ball makes it all the way up the slope. You certainly don't want to see the ball rolling back down toward you after coming up short of the top of the tier. As long as you get somewhere up on the top, you should have at least a reasonable chance to make your putt and save your up and down. So, how should you approach this shot? There are two main options, each of which is highlighted below. Use spin to stop the shot. This is the aggressive option, and you are going to need a clean lie to make it work. If your ball is resting on the short grass and you feel like playing aggressively with this chip shot, you can hit the ball hard into the slope and use spin to bring it to a stop. This type of shot is played with a lofted wedge – usually a sand wedge or lob wedge – and the ball will be placed near the middle of your stance. 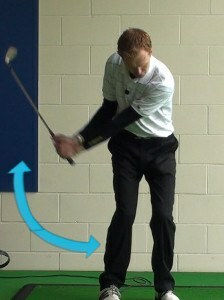 Hit down on the ball firmly at impact, imparting as much spin as you can when sending the ball on its way. If you strike the shot nicely, the ball should bounce once or twice before coming to a quick stop. The idea here is to land the ball either into the slope, or just before the slope. The bounces will take the ball up to the top, and it will then stop almost immediately. Needless to say, this is an advanced technique which requires a steady nerve to execute under pressure. If you miss-hit this shot at all, the ball won't have much spin and it will probably bounce and roll well beyond the target. Or, if you don't carry the shot far enough in the air, the spin may cause the ball to stop before it reaches the top of the tier – and it will roll back down the slope. This is a shot which needs to be practiced extensively before it is put into action out on the links. Use pace and slope to stop the ball. This other option is not going to use spin to bring the ball to a stop, but rather it will use the pace of the shot and the slope of the ground. Here, you are going to play a low running shot, often called a bump-and-run. While it will be easier to control this shot from a clean lie in the fairway, you can use it from the rough as well. The goal is to get the ball down onto the ground and rolling as quickly as possible. Once the ball is on the ground, it will behave just like a putt the rest of the way. As long as you have judged the speed correctly, the ball will roll out toward the cup and come to rest, leaving you a short putt for your up and down. 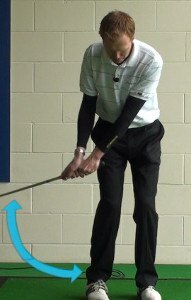 There is less risk involved in this method, but some golfers find it harder to control their distance precisely. Through plenty of practice, you should be able to determine which of these two options is going to be best for your game. Ideally, you will develop confidence in both of them, so you can pick from either option depending on the situation at hand. If you have to chip to a two-tiered green, you usually want to be in the position of chipping up the slope. Of course, that is not a surprise, as you almost always want to be below the hole in the short game. Playing short shots uphill is easier than playing them downhill, since it is not nearly as difficult to get the ball to stop. Moving on, we are now going to address the challenge of playing a chip shot down the slope to a lower tier. This is almost always going to be a tough shot, but there are some strategies you can use to give yourself a reasonable chance at success. The first thing you need to understand is that your expectations need to match the shot at hand. This is a tough shot, and you shouldn't be expecting to navigate it perfectly. Leaving the ball right next to the cup would be quite an achievement, and you should be pretty happy with simply chipping the ball onto the right tier. Just as we did in the previous section, we are going to highlight different options you can use when playing this type of shot. However, rather than the two options that we found when chipping up the slope, there are going to be three options at your disposal when going down the tier. Bump-and-run down the hill. When the slope isn't too severe, you may be able to simply play a bump-and-run chip across the green, down the tier, and to the hole. It will always be a bit tricky to control the speed on this shot, but it is still the safest option on a relatively tame green. Of course, you'll want to be sure to apply enough speed to the shot to avoid leaving the ball on top of the tier. This is the first option you should consider, since it is the easiest to play, and it is also the best bet when you have a bad lie. Use spin to stop the ball at the top of the tier. This is similar to the shot that we mentioned in the previous section, where you chip the ball into the slope and use slope to stop it quickly. In this case, you are going to again use spin, but you are going to land the ball on top and use the spin to take speed off the shot before it rolls down the slope. Basically, the shot should land on the high section of the green, bounce once or twice, almost come to rest, and then roll down the hill toward the hole. You won't be surprised to learn that this is a difficult shot to pull off effectively. You are going to need a clean lie in order to get the spin you need, and your nerves need to be steady in order to strike the ball perfectly. Miss-hitting this shot will lead to a lack of spin, and the ball is going to travel way too fast as it goes down the hill. This is an option you should consider when the pin is located right at base of the slope. If you pull it off correctly, the ball can trickle down the tier and come to rest much quicker than if you used the bump-and-run shot. Carry the ball over the tier. The last option on our list just might be the most difficult. If you don't think you can stop the ball on the lower tier using either of the first two choices – which may be true if you are facing a particularly steep ridge – your only option may be to fly the ball all the way down to the lower section of the green. Needless to say, this is a very challenging shot. You have to clip the ball off the grass just perfectly to toss it high in the air without hitting it too far. You will need a good lie to attempt this kind of shot, with your ball either sitting on the fairway cut or just into the short rough. Play the shot with your most-lofted club, and lay the face of that wedge open at address to maximize loft. Then, make a big swing and do your best to cut under the ball cleanly. When you pull it off, the ball will jump high up into the air, and land softly when it comes back down. If you manage to do all that, and judge the distance right, you could be left with a brilliant result. Despite the potential for a great outcome, this is a shot that is best left as a last resort. It's hard to pull off, and it's never going to be consistent, even for a skilled golfer. You have three main options at your disposal when chipping from the high side of the green down a tier, but none of them are all that attractive. This is a situation you would rather not deal with at all, since the chances of getting up and down are relatively low. Take some time during practice to work on these three kinds of shots and you will have all of them available to you on the course. Even if this situation is not a good one, you can make the best of it by picking the right shot and executing it properly. With chipping up the slope and chipping down the slope covered, the remaining situation to discuss is chipping across the side of the slope toward the hole. Depending on the severity of the slope, and the angle of your shot, this could be the toughest situation of all. There are multiple factors at play here, so you will have to think through the shot carefully before you decide how to proceed. In this section, we can't really provide you with a list of different shots to use, because there are just so many different possibilities here. Instead, we have created a list of points to think about when facing this difficult shot. Find a landing spot. This tip isn't exactly unique to chipping across a slope, since you should pick a landing spot for all of your short game shots. It is particularly important here, since you need to figure out where the ball should land in relation to the slope in the middle of the green. Ideally, you will be able to avoid landing the ball right in the middle of the tier. You'll want to either land the ball below or above the tier, depending on the angle of the shot and the location of the hole. Don't take on too much risk. The first goal you have in mind when playing this kind of shot should be to have the ball finish on the same level of the green as the hole. So, if the hole is on top of the tier, your ball needs to wind up on top of the tier, as well. Or, if the hole is on the bottom level, you'll need to make sure to keep your ball down below. With this in mind, pick a smart landing spot that is going to ensure you end up on the right level. If you cut it too close while trying to hit a perfect shot, you might end up on the wrong level, and you will have a particularly difficult putt as a result. Think about your lie. If you have a good lie on short grass, you can consider using spin to your advantage. However, if the ball is sitting down in longer grass, spin isn't going to be an option. Take a moment to take a close look at your lie and decide how the grass around and under the ball is going to influence the outcome of your shot. There isn't anything we can say here that is going to make this an easy shot. It's tough to play across a tier when chipping, as there is likely to be a lot of side-to-side break to deal with. When you do find this situation, remember that you need to play it safe and make sure to get your ball on the right tier first and foremost. Even if you don't hit a great shot, leaving your ball on the right tier can help you minimize the damage as you finish out the hole. In this last section, we are going to turn away from the topic of chip shots and talk about how to make good decisions on your approach shots. After all, if you can position your ball properly with the approach you hit into the green, you won't have to deal with the challenging chip shots that we have been talking about in this article. The first thing you need to do is pick a club that is likely to leave your ball on the proper level. If the hole is cut in the back, make sure you take enough club to get up over the top of the ridge. Or, if the hole is cut in the front, use a club that is either going to land right next to the hole, or come up just a bit short (unless there is a hazard short of the green to work about). Smart club selection is a big step in the right direction toward staying away from tricky spots around two-tiered greens. Another key when hitting an approach shot to a two-tiered green is to take note of whether you would rather be on the left or right side of the green. If the green has any side-to-side tilt, you'll want to wind up on the low side, so you can make your next shot a little bit easier. Favor the low side when picking a target, and use a ball flight that it is going to make it more likely for you to wind up on that side, as well. Even if you don't place your approach shot in the perfect spot, finding the low side of the green is going to make your next shot much easier to handle. Finally, you'll want to think about bringing your approach shots in low to a two-tiered green when the hole is cut in the back. A low approach shot is going to encourage some bounce and roll after the ball lands, and that is going to help you get all the way on top of the back tier. You don't have to use this strategy on every approach shot into a two-tiered green, but it is effective when the hole is cut toward the back of the putting surface. If your favorite golf course features a number of two-tiered putting surfaces, you will want to have plenty of options at your disposal when you have to hit a chip shot from around one of these greens. The advice provided in this article should point you in the direction with regard to how you'll want to approach these kinds of shots. Of course, no part of your game is going to improve without practice, so spend some time learning how to play these shots in practice before using them on the course. Good luck!